There is a bit of glare on the canvas. It’s still wet and I am not sure it’s finished yet. I just wanted to talk more about the workshop that made it possible to paint it. This past week saw me taking the opportunity to participate in a workshop with Andrea Mossop. 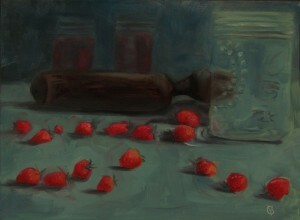 Besides being a wonderful artist and teacher, she has received some of her training from Hugh Mackenzie. He, in turn, was a student of Alex Colville. The intensive 3 day workshop was rich with the a rare insight into and understanding of Colville the artist and person, as well as the tools of composition and design that he used so masterfully. Andrea, therefore, made us draw, without reference to the photos we had selected. 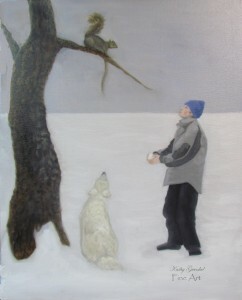 With strict obedience to these resulting sketches, we then went looking for relationships–the things that exist between things and make us want to represent them in the first place….a squirrel, a boy, a dog. A simple moment in my life and in theirs. It was humbling to see how simple and pure the resulting images are–to me anyway. Thank you Alex. Thank you Andrea. Peony season is one of my favourites. I watch and wait for the ants to come and tickle the buds to make them open. So glad I grabbed a few to bring inside before the rain caused them to swoon like southern belles. 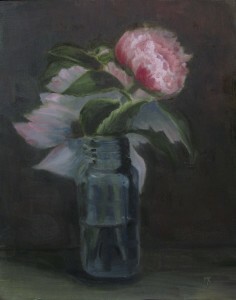 Petals are now spread like a big pink skirt on the ground and I am already looking forward to peony season next year.